"Improving our mental health is one of the most important investments we can make. We're happy to spend time toning and shaping our bodies, so why not get our minds in shape, too?" We can make conscious efforts to do both, though, and in this two part series, I hope you will find some helpful tips on how to make your mind, your body, your space, and your day just a little better. Did you know that every morning you wake up, new baby nerve cells have been born while you were sleeping and they are crazy ready to go in whatever direction you send them? It's true. And the way you choose to use them is completely up to you. Some people wake up and are grumpy and these nerve cells become grumpy and last throughout the day being grumpy little energies that emit through your persona. Or you can wake up, open your eyes, smile, stretch, leap out of bed with the mentality that today, regardless of what it holds, will be a good day - a great day! - and you will make the most of it. It's all a matter of perspective. And the type of perspective you choose to have will impact your brain short-term and long-term. A simple way to start this is to have a good morning routine. What makes you feel best in the morning, when you first wake up? (And no, "hitting my snooze button" or "sleeping more" won't work for me.) Figure this out on your own and write down your preferred first-thing-in-the-morning action. Personally, I like to wake up and get out of bed right away. This prevents me from being lazy and choosing to just lounge in bed and get nothing done. Once I'm up, I brush my teeth, tame my mane's bed head, and honestly, I will crawl back into bed but I'm too awake now to sleep, so I do one of two things - I either read or write. Even if it's just for a few minutes. There's something spectacularly peaceful about recording one's thoughts or reading someone else's just as the sun is starting to ebb through your curtains. The world is waking up and so are you. Rearranging your room is one thing, but there's nothing wrong with giving it a little extra love too. 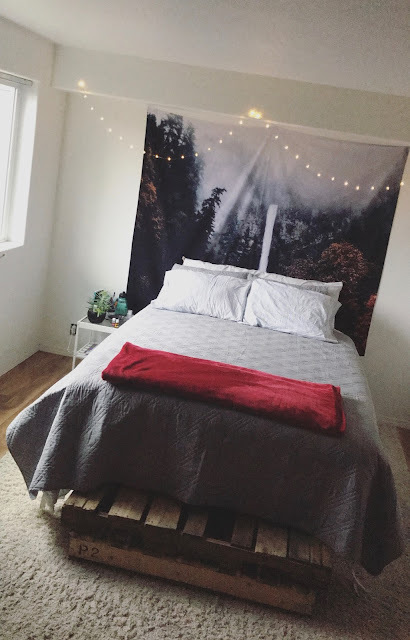 So buy that pretty set of sheets you saw, spend a few bucks on that cozy pillow or blanket, add the tapestry to your Amazon cart, hang lights above your bed, write encouraging notes on your mirrors, buy yourself a bouquet of flowers, rearrange your bookshelf by genres... There a many ways to make your space YOU. And don't forget that it's your sanctuary - where you come home to after a long day of work, where you want to relax and enjoy yourself. Make it your haven. 3. Surround yourself with positive energy. And no, I'm not gonna get all weird on you. I know people get freaked out by the words "energy" and "aura" and "vibes" but it's not all just New Age-y-ness. There really is a sense of spirituality that comes with these words and it's something to learn about, not fear. I have educated myself, over the years, to cycle out anything that is bringing negativity to my life - whether it's a person, place, thing or feeling. Doing this has brought me to a place of identity, self-confidence and positivity because I create and guard my space, my heart, my surroundings. For example, I don't let just anyone into my room. I try to keep any arguments, negative emotions I'm feeling, anything that triggers bad memories, books/movies I don't like, etc. out of my space. If they do end up in there for some reason, I use essential oils and crystals to purify. Music is so powerful, and no matter what mood you're in, there is always a genre that will fit your emotions or be the means to change what you're feeling. I keep music on 24/7. If it's not playing, I'm singing to myself. If I'm not singing, I'm humming. If I'm not humming, I have a song playing in my head. From the second I get out of bed, till I'm winding down with meditation and reading for the night, I have music going. This is a way I keep myself focused, and happy. I have found myself in situations where I start to feel anxious and then I realize - "I don't hear any music", so I'll immediately turn some on or start singing until I can play a song on my phone or computer or in my car. This may sound like I'm relying a bit too much on it, but I believe music is something God has given us to utilize for many different reasons and next to spending time in His presence and talking to Him, music and writing are my other outlets for sanity. This can include essential oils, plants, crystals, a window that gets a lot of sunlight, whatever you decide works best for you and what your soul finds most attractive and invigorating. I've grown up always having essential oils diffused around the house or wearing diffuser necklaces/bracelets. I have a diffuser in my room that I turn on at the beginning and ends of my day. I have an assortment of about thirty different oils that I can use, as well as a big window near my bed that I allow natural light to come through and shine onto myself and my plant babies. If I can't be outside in nature, I try to bring as much nature to surround me. Before you start creating some crazy mental image of yoga poses and are freaked out by even attempting to try it out, remember that stretching and being in touch with your body, mind and heart is so very healthy for you. Meditation centers your mind, too, after a fitful night's sleep or a long, hectic day. Start out small and simple. A couple breathing techniques here, a yoga stretch there. Don't overwhelm yourself right from the get-go. Ease into it, watch tutorials, listen to podcasts. Learn about it and enjoy yourself along the way. Comment below ways that you make your day and life healthier, and stay tuned for part 2 of this series! these tips were so cute :) thank you for sharing them. I wouldn't call myself a minimalist (I love too many books, pictures, pretty memorable things etc for that ;)), but decluttering does it for me -- helps with clarity of thought and focusing -- such a wonderful spacious feeling!